Day of The Dead is a celebration where friends and family reminisce about those who have died… with plenty of food and drink as an offering. Every year, about the middle of October, I build a shrine in my house full of the traditional favorites of my dearly departed including marigolds, candles, photos, and their favorite foods and beverages. I have a bottle of Peppermint Schnapps that slowly goes down every year. My little brother Tim died when he was 27 years old. We use to hit the Schnapps at Stand Up Franks in Minneapolis every St. Patrick’s Day. Schnapps is the drink of choice at my altar so stop by. I love this holiday. 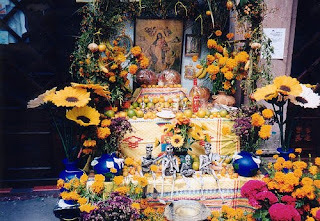 One would think that El Dia de los Muertos (Day of the Dead) is a sad day but to the contrary, it is a celebration. It is observed in Mexico on November 1st (All Saints Day) and November 2nd (All Souls Day). The intent is to encourage visits by the souls, so that they will listen to the prayers and the observations of the living. For anyone you've ever adored who has died, there is no better way to spend the month. During that time, I also cook meals that they loved. For instance, I will cook a Chinese dinner because it was my mom’s favorite. I will grill a steak because my dad was an expert at it. The celebrations can take a humorous tone, as people remember funny events and anecdotes about the departed. Family altars are vibrant. The living shower the deceased with food and presents and decorate the graves and recount their stories of their loved ones. It is such a beautiful holiday of celebration so I hope that you are busy building an altar and cooking all of their favorite foods to celebrate everything that they brought to your life.